if you let it get the better of you. When putting conditions are made more difficult by a strong wind, it is important to retain both your composure and your balance. When there is a strong wind, it does not mean you have to putt poorly. You cannot expect always to play in calm conditions as golf is an outdoor game. Certainly it is easier to putt when there is no wind blowing, but there will be days when your ability to cope with the wind will be tested. Unless the wind is blowing strongly it won't have a huge impact on the roll of your ball since the wind is less powerful near the ground. Maintaining a positive state of mind. Keeping your body from moving in ways that ruin your chances of making an effective stroke. To putt well in the wind you must have a good attitude. This is a tough ask as the conditions will try your patience and your putting. However, if you allow yourself to get annoyed, you will only make your putting worse. Decide from the outset that you are going to meet the challenge head-on. Anticipate that you may play over your handicap – but don't fall into the bad habit of complaining. Remember that everyone on the course is in the same boat. However, those with a good attitude will cope better with the conditions than those who complain, and get frustrated with the effects of the weather. Widen your stance by spreading your feet farther apart than you would normally. 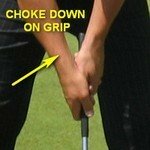 Choke down on the putter shaft and firm up your grip. Avoid grounding your putter. The rule regarding wind has changed (see below), but you don't want to end up in a discussion over what was the cause of your ball moving. Shorten your backstroke to make solid contact easier. When you are uncomfortable over the ball and are having difficulty in staying still, you will tend to lose concentration and rush your putts. You need to guard against any quickening of your tempo by following your normal Pre-putt Routine. You may have to modify it a little as it is unwise to ground your putter or take any rehearsal putts near the ball. This is because you will be penalised if the ball moves unless it is known or virtually certain that you did not cause it to move. One further caution - be careful to control the putter head as you hover it since the wind could blow it into the ball and cause it to move. Wind in excess of 20-mph will test your putting skills. With a good attitude and a solid setup you can improve the success rate of putts holed. Finally go out and practise on windy days. Experiment with your setup and putting stroke. This preparation will better help you to meet the challenge of windy conditions.